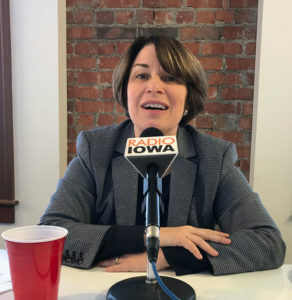 Democratic presidential candidate Amy Klobuchar visited flooded areas of southwest and northwest Iowa this weekend, emphasizing the need to improve flood protection measures and make “climate smart” infrastructure choices. Klobuchar, a U.S. Senate from Minnesota, has unveiled a $1 trillion plan to improve the nation’s infrastructure. It includes expanding rural broadband service and Klobuchar went to the Farmer Mutual Telephone Company office in Stanton to meet with local officials and business owners. Klobuchar made the same point Saturday during an appearance at the “Heartland Forum” in Storm Lake. Klobuchar said there are a host of issues Democrats can and should address that are important to rural America. Klobuchar proposes repealing some Trump-era tax cuts in order to invest in critical infrastructure. She said Americans, no matter where they live, care about upgrades to municipal water supplies and inland waterways as well as mass transit and rural broadband. Three other presidential candidates — Massachusetts Senator Elizabeth Warren, former Maryland Congressman John Delaney and former San Antonio Mayor Julian Castro — also appeared at the ag-issues forum in Storm Lake Saturday.